Sign up to be the first to know about upcoming events, workshops, and much more! Just click Sign up! and then check your email to confirm your subscription! 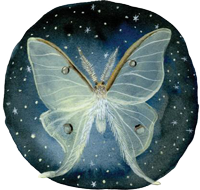 The Moth and Moon Studio is inspired by the love and trust of Spirit and evolved from the passion of Danielle Dionne. Its mission is to build a community around spiritual development and create a space for those seeking to explore and expand their gifts. With a strong focus on Mediumship and Psychic Development, the studio offers ongoing development groups, demonstrations, workshops and guest speakers. The studio also offers meditation and alternative healing arts trainings as well as special events.